Also in this series: 21-25, 26-30, 31-35, 36-40. After selecting Kohl Stewart with the fourth overall pick in last year's draft the Twins used their fourth-round pick on another high school pitcher in California left-hander Stephen Gonsalves. Baseball America's pre-draft scouting report noted that he "entered the spring as a potential first-round pick, but his stock has fallen as scouts have been disappointed with his inconsistent velocity and command." Gonsalves signed for $700,000--which is $150,000 more than third-rounder Stuart Turner and $320,000 more than fifth-rounder Aaron Slegers--and had a very impressive pro debut, posting a 0.95 ERA and 39 strikeouts in 28 innings split between two levels of rookie-ball. Gonsalves is 6-foot-5 with a low-90s fastball and developing curveball, which along with the strong debut suggests plenty of long-term upside. He won't be 20 years old until July, so the Twins figure to take things very slow with Gonsalves and even if everything goes according to plan he likely won't enter into their big-league plans for another few years. He'll probably spend most of this season at low Single-A, perhaps with a workload limit, and one thing to watch is whether he can continue to miss a ton of bats while showing decent control. Tyler Jones wasn't particularly good as a starter at LSU, but the Twins liked his mid-90s fastball enough to take him in the 11th round of the 2011 draft. He had a rough pro debut at rookie-ball after signing for $105,000 and then posted a 4.67 ERA at low Single-A in 2012, which caused the Twins to move him from the rotation to the bullpen last year. Jones thrived as a reliever, striking out 66 batters in 52 innings while holding opponents to a .196 batting average and zero homers. Jones is already 24 years old and has yet to pitch an inning above Single-A, but he should move fairly quickly now that he's a full-time reliever. And even while struggling overall as a starter in 2012 he missed a ton of bats, striking out 102 batters in 87 innings. He also has the raw stuff to match, complementing a mid-90s fastball with a hard slider and throwing it all from a 6-foot-4, 250-pound frame. In other words, he has late-inning potential. For that to happen, however, Jones will need to improve his control. He issued 3.6 walks per nine innings as a starter in 2012 and 3.4 walks per nine innings as a reliever last season, although he did show some strides down the stretch at high Single-A. He throws hard and he generates tons of strikeouts while inducing lots of ground balls and very few homers. Jones, Michael Tonkin, and Zack Jones give the Twins a trio of high-upside reliever prospects. When the Twins drafted Adam Walker in the third round out of Jacksonville University in 2012 they touted his power potential and so far that skill has lived up to the hype. He has 41 homers in 187 career games, including 27 homers and 65 total extra-base hits in 129 games at low Single-A last season. Not only did he lead the entire Midwest League with 27 homers, no other hitter went deep even 20 times. He also led the league in total bases, slugging percentage, and RBIs. So why isn't Walker much higher on this list? For one thing he posted those impressive power numbers as a 21-year-old with college experience spending a full season at low Single-A. That's not elderly, but age and level of competition are always important factors in evaluating prospects. Beyond that, Walker's plate discipline is terrible. He struck out 115 times compared to just 31 walks and his lack of strike-zone control has been a red flag dating back to college. Elite power is a helluva skill to have and he's also a good athlete, but it's tough to get excited about a corner outfielder with a .316 on-base percentage and 191/50 K/BB ratio in the low minors. Walker had 184 strikeouts in 168 college games and 191 strikeouts through 187 games as a minor leaguer, and he's done all that whiffing with a swing-at-everything approach that hasn't led to a decent walk rate. He's intriguing, but a major adjustment will be needed at some point. Niko Goodrum spent three seasons in rookie-ball after being the Twins' second-round draft pick out of a Georgia high school in 2010, finally moving up to full-season competition last year. He got off to a very nice start at low Single-A, hitting .270/.382/.388 with 31 walks in 48 games before a home plate collision on June 2 left him with a concussion. He returned two weeks later, but then went through an ugly 20-game stretch in which he hit .151 with 22 strikeouts. Goodrum bounced back to hit .286/.379/.397 in his final 34 games and ended up ranking among the Midwest League's top 15 in walks and on-base percentage. That's impressive for a 21-year-old shortstop, but Goodrum's lack of power, relatively high strikeout rate, and career .246 batting average are all potential red flags for the switch-hitter offensively. And ultimately a huge portion of his long-term upside depends on whether he can remain at shortstop defensively. He's big for a shortstop at 6-foot-4 and has made lots of errors so far, but that isn't necessarily indicative of anything negative and unlike several other one-time shortstop prospects the Twins haven't moved Goodrum off the position yet. He's also a good athlete, went 20-for-24 stealing bases last year, and has always gotten praise for a strong throwing arm. Goodrum's skill set is an interesting one with a lot to like, but the flaws are noticeable too. Mason Melotakis starred as a reliever at Northwestern State, but like several of the other college relievers the Twins selected in the 2012 draft they gave him a chance to become a starter. So far it's gone fairly well for the second-round pick, as Melotakis transitioned to the rotation at low Single-A last season with a 3.16 ERA in 111 innings, allowing just six homers and actually faring slightly better versus righties than lefties despite being a southpaw. However, his strikeout rate of 6.8 per nine innings wasn't impressive and even that was inflated by some late-season relief work. As a 22-year-old with college experience Melotakis was also old for the level of competition and after finishing the 2012 season in the Midwest League it's a little odd that the Twins let him spend all of 2013 there as well. His inexperience as a starter surely played a part in the lack of a rush to promote him, but now he's 23 heading to high Single-A. This year should reveal a lot about whether Melotakis has a future as a starter and if he continues to fare well it'd be nice to see the Twins give him a midseason push up to Double-A. He works in the low-90s with his fastball and gets positive reviews on his slider, which is a combination that makes the bullpen a safe fallback option. Right now he looks like the best bet to ever be a full-time member of the Twins' rotation among all the college arms they drafted in 2012. By choosing high school pitcher Kohl Stewart with the fourth overall pick the Twins took a huge risk and veered away from their typical draft strategy, but they went back to normal in the second round. 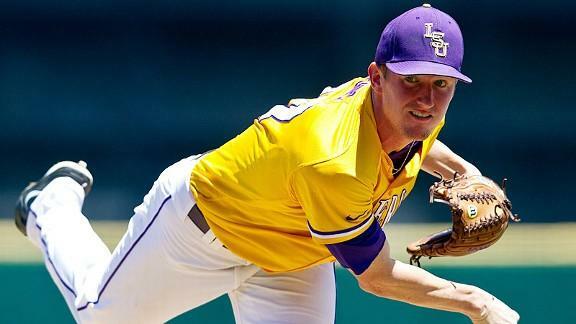 As a college starter with three seasons of major conference experience LSU right-hander Ryan Eades was a prototypical Twins target with the 43rd pick and in fact he's the eighth college pitcher selected by the Twins with a top-50 pick since 2005. Eades missed his senior season of high school following shoulder surgery, but was injury free for three years at LSU and led the team in starts this season. However, fading down the stretch in both 2012 and 2013 puts his durability in some question and caused ESPN to rate Eades as the draft's No. 59 prospect despite noting that he "looked like a mid-first-rounder for the first seven weeks of the season." Even after a late-season fade Eades finished with an 8-1 record and 2.81 ERA in 16 starts for one of the best teams in the country, but a .269 opponents' batting average and just 77 strikeouts in 96 innings are underwhelming. And that modest strikeout rate is actually an improvement over last season, when Eades managed just 63 strikeouts in 94 innings while allowing opponents to hit .296. Combined during his final two years Eades averaged 6.6 strikeouts per nine innings. Eades' bat-missing ability paled in comparison to LSU's aces. Last year it was Kevin Gausman, who was drafted fourth overall by the Orioles, and averaged 9.8 strikeouts per nine innings. This year it was Aaron Nola, who projects as a potential top-10 pick in 2014, and got 9.2 strikeouts per nine innings. Eades obviously isn't on the same level as Gausman and Nola or he wouldn't have been available at No. 43, but the point is that his raw stuff has yet to turn into strikeouts. With that said, it's good raw stuff. Baseball America rated him 37th in the class, noting that Eades "looks the part of a frontline starter" with "an athletic 6-foot-3, 198-pound frame" and fastball that reaches the mid-90s. According to BA he's "honed his breaking ball into a power curveball" and also works with a two-seam fastball and a changeup, the latter of which may prove to be the key to Eades developing into a successful big-league starter. In the third round the Twins selected University of Mississippi catcher Stuart Turner, who has a reputation for being a good defender with an iffy bat despite hitting .374/.444/.518 in 62 games this season. Turner played just one season against top-flight competition, transferring to Ole Miss from a junior college, and Baseball America notes that "scouts don't like his swing and question his ability to sting the ball consistently." There are no such questions behind the plate, as BA calls Turner the best defensive catcher in the class who "combines strength at 6-foot-2, 220 pounds with flexibility, agile feet, and excellent arm strength." ESPN offers similar praise, calling Turner the draft's "best catch-and-throw guy" with "outstanding hands and a plus arm." All of which suggests that he'd project as a backup if the scouts are right to doubt his bat and a good all-around starter if the numbers prove them wrong. In the fourth round the Twins took another high school pitcher in California left-hander Stephen Gonsalves, who actually rated three spots higher than Turner on BA's list. Their scouting report says he "entered the spring as a potential first-round pick, but his stock has fallen as scouts have been disappointed with his inconsistent velocity and command." When he's going well Gonsalves throws in the low-90s and at 6-foot-5 "is intriguing because of his body and projection." And he's tiny compared to fifth-round pick Aaron Slegers, a 6-foot-10 right-hander who starred for Indiana after barely pitching before this season due to injuries. Slegers walked just 15 batters in 16 starts and had a 2.16 ERA, but also managed just 54 strikeouts in 97 innings. BA notes that he's capable of reaching the mid-90s, but "got tired as he dealt with a regular workload for the first time" and lacks a consistently effective breaking ball. In the eighth round the Twins took Slegers' teammate, third baseman Dustin DeMuth, who led Indiana with a .389 batting average but didn't draw many walks or hit for much power. According to BA scouts aren't sure if he'll stick at third base defensively and despite being 6-foot-3 his swing isn't really conducive to power development, but "he makes consistent contact ... with plus speed and arm strength." Florida high school catcher Brian Navarreto was the sixth-round pick and the Twins took another catcher, New Mexico senior Mitchell Garver, in the ninth round. Based on skills alone Navarreto may have gone 2-3 rounds higher, but his involvement in an ugly on-field brawl likely dropped his stock. Garver had good numbers in a hitter-friendly environment and he's a typical "senior sign" who's already agreed to a below-slot deal that saves the Twins money to use on other picks. In all the Twins had 10 of the first 300 picks in the draft and used all but one of them on pitchers or catchers, with DeMuth the only exception. Loading up on pitching certainly isn't surprising, but taking catchers in the third, sixth, and ninth rounds stands out as an unexpected strategy. Overall they went for long-term upside in Stewart and Gonsalves, did their standard thing with a bunch of college right-handers, and stocked up on backstops. 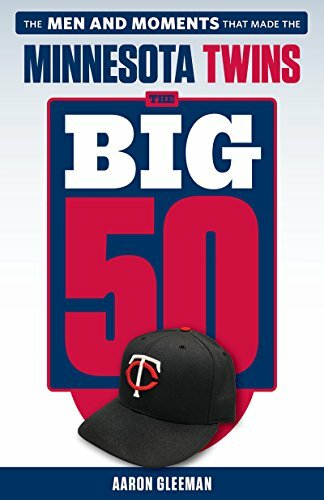 It'll be hard for the 2013 draft to look like a good one for the Twins unless Stewart pans out, but in general their approach seems fairly sound and based on pre-draft rankings from BA, ESPN, and MLB.com they didn't really step too far out on a limb with any selections. Last year it was tough not to love the Twins' draft haul because of Buxton at No. 2 and a bunch of extra early picks as compensation for losing free agents, but this year's group has a lot to like too. 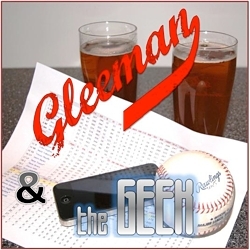 For much more on the Twins' draft picks, check out this week's "Gleeman and The Geek" episode.